We all know them—people that are always positive, always upbeat. Well, you’re going to meet one of them. Dr. Randy talks to Cindy, the “Flag Lady”, at the Diamondback’s games in Phoenix. Simply put, be thankful. Think about things that have occurred that you’re grateful for: healthy children, an intact marriage, a place to live. Don’t take your blessings for granted. A great idea is to create a “Praises and Blessings” list and review it regularly with your family. Having a spiritual routine that involves reading Scripture, praying individually and together as a family, and meditating on the goodness of God is an absolute must. As you strengthen your relationship with the Lord – every day, without fail – you will fill your mind with His promises and truths, giving you a joyful outlook, even on Monday. Cindy McBride is a huge baseball fan—especially of the Arizona Diamondbacks! More importantly, she is a passionate follower of Jesus. Cindy carries her faith to the ballpark and to the workplace and to all of her circles of influence. Sometimes she faces push back, but many times she finds her faith drawing people to Christ. 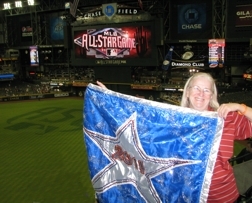 She is known as “The Flag Lady” and “Rally Sally” at Diamondbacks games. She sews beautiful flags for each player and waves his personal one when he comes to bat. Then she has one for the pitchers, too. Her familiarity with the D-backs has allowed her to meet, pray for and share Jesus with the players. She often gives them a book she found that compares faith and baseball. Cindy has faced—and still faces—many challenges in her life. But her faith never subsides, because her God is always faithful. So if you go to a Dbacks game or see one on TV, look for “The Flag Lady” because she is not only waving flags for baseball, but also waving God’s “Banner of Love” to her world. Now you can learn the Biblical principles to leading an Intentional Life. Listen, live, and learn as Dr. Randy Carlson shares how you can develop true appreciation and value of your time. I read this article and found it very interesting, thought it might be something for you. The article is called Attitude Check and is located at https://www.theintentionallife.com/broadcasts/attitude-check/.